Hello creative friends!! Kathy Racoosin of The Daily Marker is unleashing a world of color on her blog and Instagram (@kathyrac) this month, and she wants all of us to join her in the fun! 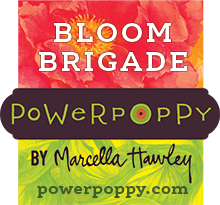 To kick off the challenge, Power Poppy’s Marcella Hawley has a surprise of epic proportions! 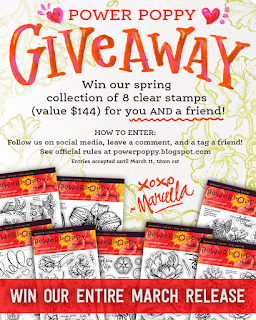 She’s giving away Power Poppy’s SOON-TO-BE-UNVEILED MARCH CLEAR STAMP SET RELEASE! That means EIGHT of the freshest, most fun Power Poppy designs to hit the market yet. It's a $144 value! Plus you can enter a friend to win. Read all the details here! Also...one more thing that you won't want to miss out on...Power Poppy is offering 25% off all digital stamps for folks all month long - to coincide with the Daily Marker's 30 Day Coloring Challenge. All you have to do is enter the code: COLORMEHAPPY at checkout. For my card today, I used a new Power Poppy Digital image called Vintage Easter Egg. I went quite literal, and colored the image with a vintage color palette in mind using muted colors. I also ink distressed around the circle, using Antique Linen (Ranger Distress Ink) to age it up a bit. A few diecuts were used too. The background panel was cut using Avery Elle's Double Pierced Rectangle Die. 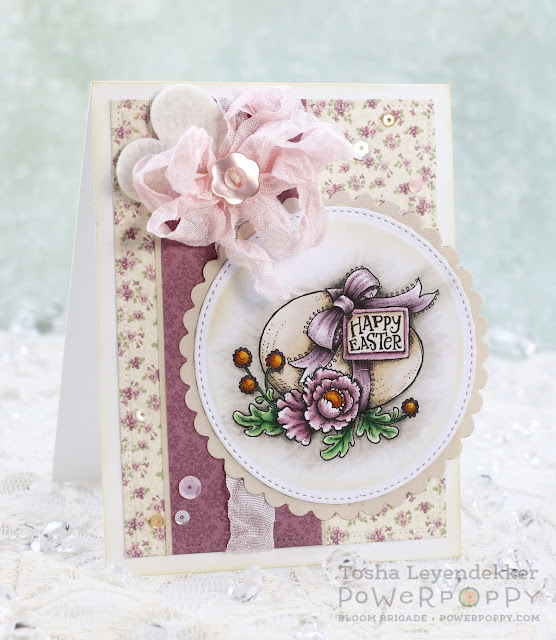 The Stitched circle is from Couture Cuts, and the Scalloped Die is from Spellbinders. I added some seam binding ribbon and some sweet sequins by Pretty Pink Posh too, as well as a felt heart that I diecut using Primitive Hearts by Sizzix. The decorative paper is from Pion Design. That sums up my card for today. Today Kathy has assembled a blog hop to give your creativity a jump start with some of her favorite stamp companies & Online Card Class partners. So, pop back over to the Power Poppy Blog for the full link list of today's huge hop! Awww.... it's so beautiful Tosh! I love the vintage feel and your colouring is divine! I could write a sonnet about your Easter bonnet....Very Pretty. Beautiful, vintage and delicate! So pretty. Great composition! This is so pretty!! I love the soft, vintage feel of this card. Your bow is fabulous and I LOVE the patterned paper you chose!! Stunning card!! You win me every time you use those sweet papers with the poppy images. ( I share your love for them.) Beautiful card. Beautiful country Easter card Tosh. I like the soft papers and colors, beautiful! Gorgeous!! I love the image and The pretty dps to go with it! The ribbon is beautiful and it all comes together with a wonderful vintage vibe!! WOW Tosha your card is so elegant and your colouring is beautiful! Great work! LOVE your GORGEOUS image panel & colouring, LOVE all your BEAUTIFUL layers too! Your card is so gorgeous and so stunning!! Beautiful coloring and I so love those papers with it!! PERFECTLY DONE, Tosha!!! LOVE this image & the way you have featured it! ;) AS ALWAYS!!! OHHH! I love this image done up in purples!!! Your card is simply beautiful!! I love the ribbon flower/bow you made too! Thanks for sharing! LOving all the beautiful cards. I especially like Ally's card. I Love PP stamps but I'm intimidated by the digis. The vintage feel is wonderful and the coloring is gorgeous, as is the stamp you've used. Just beautiful! Love this image!~ You colored so beautifully! So excited to have found Power Poppy! So much talent on this hop! Thank you for sharing yours! Gorgeous with that crinkled ribbon! You definitely achieved a vintage look. Your soft colors and that floral dsp and ribbon really made a beautiful card. Love the vintage look of your card. The beautiful colors you used really emphasize the vintage look. Gorgeous, it makes me thing of my grandmother!